Plastic bumpers are a reality of life for automobiles, vans and S.U.V.s. And when they get scuffed, dented, or cracked, they look bad… really bad. Plastic bumper repair Madison is one of the essential auto body repair Madison WI services we offer and drivers are usually unaware of how affordable it is to repair plastic bumper. We do it all the time and for every make and model of car. Bring in your scuff, dent or crack, and you may be surprised at how little the repair costs. Drivers have become used to the expense of traditional auto body repair shop Madison WI services and sometimes just accept that minor body repair Madison WI will have to wait for a larger problem to develop. Auto Color makes all types of auto body repair Madison WI services affordable, and the repairs can usually be done in a single day. Protecting the original finish of your car starts with using the least invasive procedure possible to protect the integrity of the finish. If the finish itself is not damaged, Auto Color’s specialists can remove dents and use professional scratch and auto body repair Madison WI techniques to restore your car. 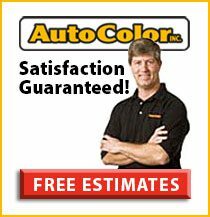 Auto Color can help your car look like new using a wide array of auto body repair techniques. We pride ourselves on providing the most appropriate repairs of any auto body repair shop in Madison WI.